The 493rd player to appear for the Gunners, Ian McKechnie was a converted winger who kept goal in a period of plentiful keepers at Highbury. He found his feet at Hull where a bizarre but amusing orange throwing fad followed him around wherever he played. Born on 4 October 1941 in Bellshill, Scotland, he started out at Lenzie in Dumbartonshire and while at Letham Thistle of Glasgow was signed as an amateur by Arsenal in September 1958. Ian signed professionally on 30 April 1959, initially as a left winger he was converted to goalkeeper by Arsenal manager George Swindin, himself a high quality keeper, after noting McKechnie’s potential during practice matches. 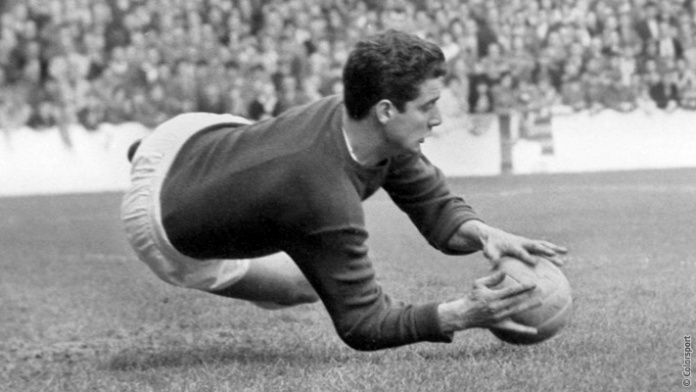 Making his league debut on 14 October 1961 at Blackburn, he kept a rare clean sheet in a 0-0 draw. One position Arsenal were not short of in this fallow period was goalkeeper, and he vied for no.1 at different times with Welsh international Jack Kelsey, Northern Ireland international Jack McClelland, Jim Furnell and Bob Wilson. Consequently, despite a reputation as a good shot-stopper he did not appear for the first team as often as his ability warranted. He played in 25 first team competitive games, letting in 43 goals and keeping six clean sheets. Within this total were two European games which were the first ever in European competition for the Gunners coming against Staevnet in the 1963-64 Fairs Cup. Indeed his final game for the club came in the second leg of the 1st round at home on 22 October 1963. It was also around this time that he was warned by Billy Wright about his weight which had ballooned to 14 stones! He also made 49 reserve, 51 A team appearances (three as an outfield player, the remainder in goal) and 44 youth team appearances (ten as an outfield player scoring three goals), which led to winners medals for the Football Combination title and London FA Challenge Cup in 1962-63, three different Metropolitan League trophies in 1960-61 and a South East Counties League Cup in 1959-60. On 12 December 1959 he played in Arsenal’s biggest post-war competitive victory, a 16-1 trouncing of Southend United in the South East Counties League. However, this game was expunged from the records when Southend withdrew from the League later in the season. 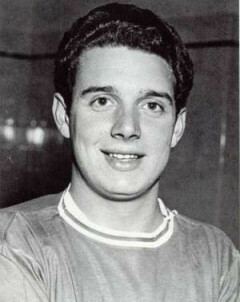 Ian joined Southend on a free transfer on 4 May 1964, and after two seasons at Roots Hall moved to Hull City in August 1966. His career kicked off from there and ‘Keckers’ became a cult figure playing 284 games for the Tigers. At Hull his personality shone through and a craze grew whereby Hull fans threw oranges into his goalmouth before kick-off and at half time, apparently on a chance viewing of him eating oranges by a couple of fans. His brother, listening to the scores on his radio, heard the announcer say the Hull result was late because the goalkeeper had been bombarded with oranges! In 1974 he went to the USA to play for the Boston Minutemen for a season, and on return to England spent time at both non-league Goole Town and Scarborough, before retiring in 1977. Ian McKechnie passed away on 11 June 2015 in Hull, aged 73. It has been stated that his family threw oranges into the grave at his funeral. A fitting tribute.